Charlies Playhouse: New science tunes from They Might Be Giants! 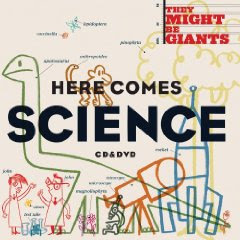 New science tunes from They Might Be Giants! Ah, the giant genius of They Might Be Giants. Their new CD, "Here Comes Science," is an anthem of science-love for children. On Amazon, you can preview the song "Science is Real," which explains to kids the difference between stories and science. Oh yes it does, and very well too. On Youtube, you can see the video for "I am a Paleontologist," which uses the word "evolution" loud and proud. I just can't wait to get my copy. The CDs ship Sept. 8th from Amazon. Here Comes Science is available now on iTunes for $14.99 for the album. Individual songs are $.99 or $1.49 for drm free. Also, the picture in the next post seems to have disappeared and the llink is dead. TMBG's latest gift to children's music is catchy, funny, and smart. Tunes from it have been running in my head all week.